Before you read any further, please try answering the following question. Who made this famous statement: “Democracy is a form of government in which heads are counted but not weighed”? The most likely answer is, "Iqbal". Technically, that is wrong. 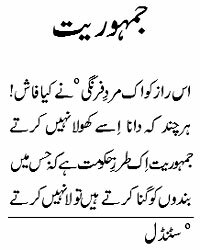 Take a look at Iqbal's poem (posted at the bottom of this post). The statement is preceded by two verses which can be translated as, "This secret was revealed by a European man, although the wise ones do no disclose it." Iqbal's footnote indicates that the reference is to Stendhal. So, the correct answer is that the proposition came from Stendhal, and Iqbal cited him in a satirical poem. Since the line is quoted so often, perhaps we should know a little more about this Stendhal, and why Iqbal quoted him. Stendhal was the pen name of Marie-Henri Beyle (1783-1842), who was part of Napoleon’s administration and military. He remained skeptical about the struggle for the restoration of democracy after Napoleon. Apparently this attitude originated in an aristocratic bias and skepticism about the potential of the human being (two factors usually cited by Iqbal as the psychological reasons for the reaction against democracy in France and England). The same skepticism seems to have prevented him from appealing to the nobler motives of his readers. Consequently, his fiction was starkly lacking in novelty, cathartic value and an appeal to imagination – elements that serve the basic purpose of all healthy stories in human society. Not surprisingly, his stories remained unpopular until a respectable word for the lack of purpose in fiction was found in the 20th Century: “realism”. With an astonishing insight, Stendhal had foreseen this at least a century earlier, predicting that he would be rediscovered in 1935 (his revival started just around that time in the West; and through Iqbal’s famous translation a year later he also became one of the authors most widely quoted in Urdu). Despite his pessimism, Stendhal’s wit is disarming. In the final analysis he comes out as a visionary who may have been connected with his society's “reaction against democracy” at the level of collective consciousness. The last couple of posts are really making waves, Iqbal and his understanding of literature is very interesting and gives not only a philosophical and literary understanding of the western thought but is also providing an psychological understanding of Iqbal’s own thought process, and the underlying reasoning that made a new paradigm for Iqbal to ensue. 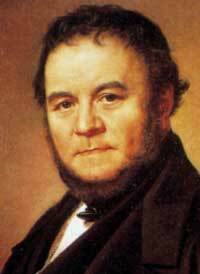 I am great admirer of Stendhal’s novel BLACK AND RED and consider it one of the best I have read. Incidentally there is a quote from Stendhal “"Beauty is nothing other than the promise of happiness” which is a basic element of Baudelaire poetry. However, when the longing and embracing of "beauty" is greater than the embracing of our COMMON humanity, I'm quite suspicious? Yet, I do realize how we all do these subjective qualifications with our own favorite artists of all kinds. So I shall try to keep an open mind. I've probably been arrogant in my critique of arrogance. It is interesting how the trajectory of human activities embodies presuppositions about human potential and worth. When the aim is low, the outcome is such. Connecting this to a Marghdeen consciousness (and an embodied Marghdeen reality), the orbit reflects a wholly different (and penetrating) view of the splendor of humanity.